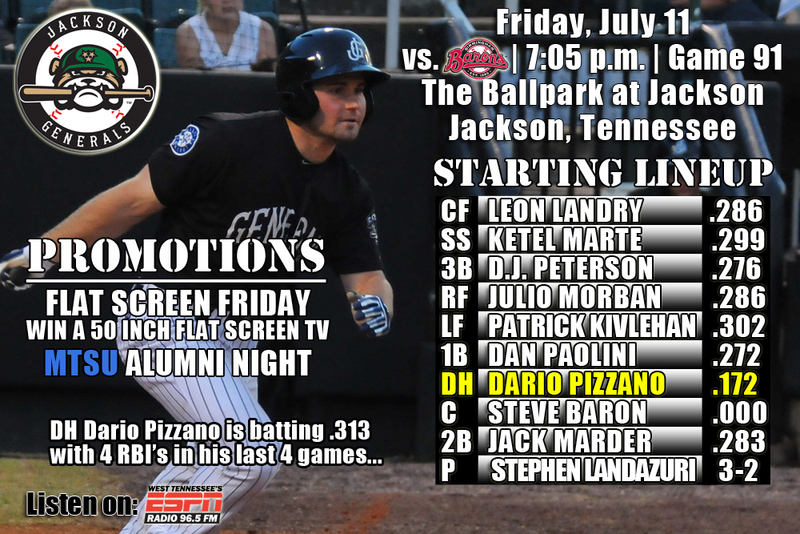 • The Generals continue a 5-game homestand tonight against the Birmingham Barons in Jackson (0-1)…are coming off a series win at Huntsville (3-2) and have won 3 of 5…also are 3-3 against Birmingham this season and will play the Barons 9 more times in Jackson the final 49 games of the season. • The Generals had 10 hits including multi-hit games from CF Leon Landry (2×5, RBI), SS Ketel Marte (2×5) , 1B Pat Kivlehan (2×4, R, RBI) and DH Dan Paolini (2×4, HR, 2 RBI), but Jackson fell in the opener against Birmingham 7-4 in Jackson. • Starter Tyler Olson (0.2,3,3,3,1,2) suffered the loss and could not escape the first inning. RH Trevor Miller (4.0,4,1,1,2,5), LH Kyle Hunter (1.0,2,3,3,1,1), RH Moises Hernandez (2.1,4,0,0,1,2) and RH Richard Vargas (1.0,0,0,0,1,0) logged innings on Thursday night. • Paolini hit his team-leading 6th home run in the bottom of the sixth inning to draw the Generals within 7-3, but that was close as it got. • Birmingham used two 3-run innings in the first and the sixth to get the victory in game one of the series. • The Generals have posted double-digit hit totals and batted .313 (55×176) over their last 5 games, winning 3 of those, scoring 28 runs on 55 hits with 7 doubles, 3 triples and 8 home runs. • Jackson now ranks 5th in the league doubles (160), 2nd in triples (30), 4th in slugging (.384) and T-3rd in batting (.262) on the season. • Patrick Kivlehan (.300), Leon Landry (.316), Ketel Marte (.318), Dan Paolini (.450), D.J. Peterson (.318) and Dario Pizzano (.313) are batting over .300 in the last 5 games. • 3B D.J. Peterson homered on Saturday, Sunday and Tuesday in Huntsville and has now hit safely in 13 of 14 games with Jackson, batting .276 (16×58) with 6 runs scored, 3 doubles, 3 home runs, 7 RBI and 3 walks. • Hot Hitting July – After batting .294 as a team in June, the Generals are currently batting .271, which ranks 3rd in the league. The 9 home runs also ranks 3rd in the league. • INF Dan Paolini has hit safely in all 8 games he has appeared in July, batting .464 (13×28) with 6 runs scored, 4 doubles, 2 home runs, 7 RBI and 2 walks. Paolini currently leads the team in homers (6), doubles (25) and RBIs (46). • OF Leon Landry has hit safely in 12 of his last 13 games, batting .328 (19×58) with 8 runs scored, 3 doubles, 1 triple, 3 RBI and 5 stolen bases. Since June 7, Landry has hit safely in 24 of his last 27 games with 14 multi-hit efforts, batting .361 (39×108) with 18 runs scored, 6 doubles, 3 triples, 6 RBI, 3 walks and 10 stolen bases. During this 27 game stretch he has raised his season average from .236 to .286. • Not such a home sweet home – Jackson has dropped 9 of 11 home games since June 24th and are 18-27 at home this season. • Success though against Birmingham at home – Since 2008, the Generals are 32-17 at home against the Barons. • D.J. Peterson was named to the U.S. Team for the upcoming 2014 SiriusXM All-Star Futures Game. Peterson will be joined at the All-Star Futures Game by High Desert outfielder Gabby Guerrero, who will play on the World Team at the July 13 game at Target Field in Minneapolis as part of the All-Star Week festivities.